On Thursday November 14th, SMA priests and students, OLA Sisters and novices from Ibadan gathered together at Oke Are Minor seminary for the annual Mass for deceased SMA and OLA missionaries. As in previous years we were joined by the Rector, staff and the students from the Minor Seminary, numbering about 200. After the Mass we went in procession to the cemetery where prayers were said and the graves blessed. It was very moving and thought provoking to stand by the graves of the missionaries who had died and were buried there. Some of them died at a very young age like Fr Edward Murphy, from Carrickmacross, Co Monaghan who died in 1937 at the age of 27 after spending only six weeks in the country. At one end of the cemetery is a memorial plaque listing the names of 111 deceased SMA priests and brothers who had worked in Ibadan Archdiocese over the years, eight of whom are buried in the cemetery. Fr Fintan Daly SMA, who himself spent 24 years on the staff of the Minor Seminary, was the main celebrant for the Mass. In his homily traced the growth of the Church in this part of Nigeria from its small and uncertain beginnings to what it is today. The first missionaries visited Ibadan in 1884, but they had come from Oyo and the king of Oyo demanded that they return to Oyo as the two Kingdoms were at war. It was ten years later, in 1894, that they came back to Ibadan. The chief ruler of Ibadan did not want them to stay at all but he was to o polite to directly refuse so he gave them a site at Oke Are which at that time was supposed to be an evil forest and he thought they would be driven away quickly by the evil spirits. But the spirits did not trouble them, but the rain often did as at first they lived in a bamboo hut, but eventually built a house and in 1900 they built the first church in Ibadan, which is still there to this day. They also intended to train young men to become Nigerian priests so in 1901 they admitted a few young men hoping they would become priests. These early candidates did not persevere, but the missionaries persevered in their efforts and eventually the first Yourba priest was ordained in 1929. From these small beginnings the Church in Ibadan has grown in a way these early missionaries could never have envisaged. At present there are over 90 priests ordained for Ibadan. The OLA Sisters were the first sisters to come to Ibadan. They came in 1912 just over 100 years ago. They came from Lagos by train. Some people cut a path through the bush from the railway station to Idikan (near Oke Padi – ‘Hill of the Priest’) where they established their first convent. When the people saw these white women coming who wore big white veils almost covering their entire faces and long white habits reaching the ground, the people said, “angels are coming” and they were right because the sisters like the fathers brought healing to the sick and education to the children and more important told them about Jesus Christ . As we remember these early missionaries and see the church that has grown from such humble beginnings we should also remember and be strengthened by the faith of these missionaries who were prepared to suffer and die for the faith and bring the message of Jesus Christ to those who had not yet heard it. Some died very young. Six died when they were less than one month on the missions, 32 died when they were less than one year in Nigeria. 129 died when they were still in their twenties. 182 died when they were still in their thirties. This means that when these early missionaries left home, they realized that they would probably never get home again. It was not only the priests that died young, 131 OLA sisters died in their twenties. At the entry to Glasnevin cemetery in Dublin there is a plaque which reads “Be still so that you may hear the whispering of God” and John Donne wrote “Ask not for whom the bell tolls, it tolls for you.” As Fr Daly pointed out in his homily, in remembering the dead we are reminded of our own mortality and of the call to follow in the footsteps of these missionaries who have gone before us and play our own part in building up the Church in our own time. Each one is called to make a difference in the lives of others for that is what mission is about. 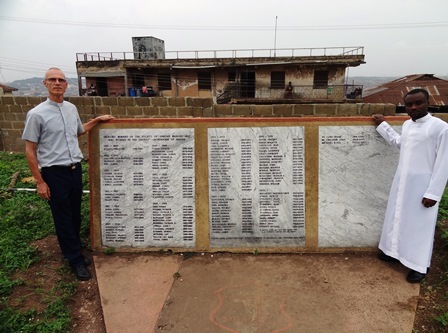 The missionaries that we honoured at the Mass in Oke Are certainly made difference. With thanks to Fr Tim Cullinane for his report and photos.